I have come to understand that expressing an idea too early can limit what it can become: clay, once fired, loses its ability to take on any form. I was not a patient child. I recall trying to put together a model of a pirate ship when I was perhaps seven years old. It came as a kit of many plastic pieces. I followed the instructions, but could not bear to wait for the glue along one joint to dry before proceeding to the next. The result wobbled in my grip like a shattered and leaking egg. This did not stop me from attempting to paint it in all kinds of garish colours, paint smearing and sticking to my hands; fingerprints left on hull and rigging. Needless to say, the ‘finished’ model was a shapeless, sticky mess. I learned to resist this impatience in making things (perhaps too well! *grin*). However, the desire to ‘see something’ as quickly as possible still lingered, with a belief that what is written or drawn or spoken is somehow better than any ‘notion’ in my head. This desire for ‘realisation’ may have something to do with performance: for it is impossible to show someone else a notion without ‘realising’ it in some way. This is also a process that is drilled into us, by parents, by teachers – and, indeed, the effort, the practicality, the skill, to realise a notion is the act of creation. The realised notion becomes a part of the world that you can perceive and examine as readily as a leaf or a stone. Further, you can compare your creation with the notion from which it sprang, and thus you are able to refine it. This process of iteration is certainly a fruitful part of creating anything. However, the creation is possessed of a reality that the notion that led to it lacks, and real things are ‘attractive’ – exerting a pull on the mind something akin to a magnetic field. My experience is that when I ‘realise’ a notion, the resulting creation becomes an attractor so strong that my perception of it displaces the very notion that was its origin. 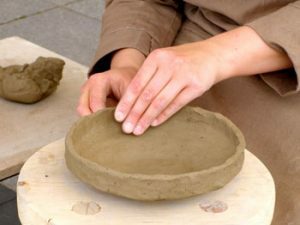 The notion, once fluid, is now fixed, and, rather than being clay that could be reshaped, it becomes merely a stepping stone to other notions – and so perhaps a different path is followed. So these are the reasons I strive to resist the temptation to ‘realise’ notions until I feel they have had a chance to reach their full form in my mind.